Wide stripes? Nah. Try the classy and eternal look of pinstripes! So lovely, so memorable, so versatile, and the great thing is, they don't look over the top like many striped things can if seen in large quantities. Moving on. This wool cashmere skirt is classy and will spice up your look all on its own. See, I really like grey, and I really like pinstripes, and the bow? Cute as kitties. 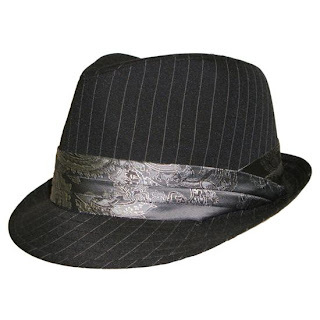 At sports-warehouse.net, you can get a look at this pinstripe trilby hat, with a great black paisley band to give the same old look a bit of flair. I love this hat, the sparkle, the whole thing. I think this is so cute! 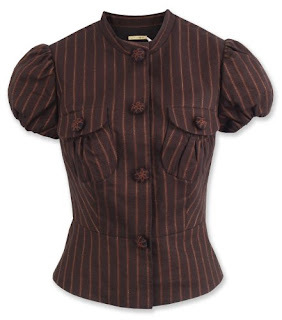 The particular colors in this shirt are elegant and sweet, like shirt candy. I also like the buttons. Check it out for a better look. And the high neck gives it a regal feel that sweetens the deal! 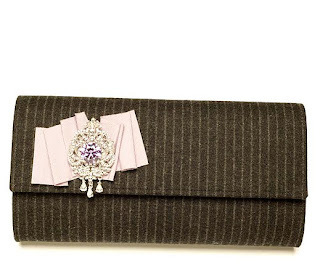 This Parisian Pinstripe Clutch is a one of a kind, like all things that Hollis Eames does. He has others to choose from, too, which are great, so give them a look! This one specifically, I like a lot, because of the sweet folded fabric and the pricey-looking pin, which made it look more expensive than it actually is. 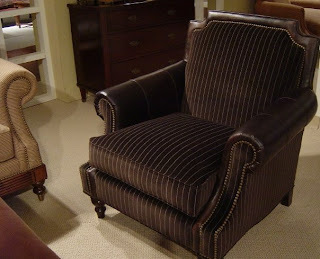 Remember, you don't have to wear pinstripe to enjoy it... it's a common pattern in furniture. But hey, who says you can't wear your living room? Carol Burnett wore that curtain dress, right? They have it on display at the American History Museum in DC.